Perhaps the MBTA needs to hire some new map makers, because even after riding the 201 and 202, I still can't make heads or tails of the routes' map. To me at least, it just looks like a mess of arrows pointing in random directions. And there are some really misleading bits, like how it shows the 201 bypassing the Keystone Apartments when it actually serves them, at least sometimes. Certain trips. But the 202 bypasses them sometimes, too. Okay, maybe it's the routes that are insanely confusing, not just the map. On weekdays, the 201 and 202 form clockwise and counterclockwise loops (respectively) to and from Fields Corner. 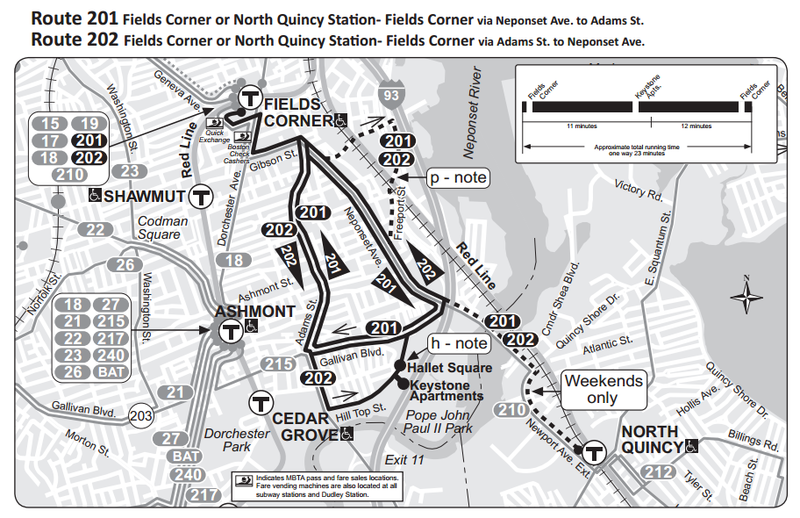 But on weekends, they form a direct link from North Quincy to Fields Corner, with the route they take corresponding to the direction the bus would normally go around the loop...it's pretty confusing. There's some nice fall foliage in the background. Anyway, a 201 arrived at North Quincy, and we made our way to Hancock Street. There was a bridge over the Neponset River, then we went around Neponset Circle and down Gallivan Boulevard. The street had a lot of ugly businesses with massive parking lots, then we turned onto Hallet Street, which felt more industrial. We went into the Keystone Apartments parking lot slowly (stupid speed bumps), but nobody got off or on. Then we headed back towards Neponset Circle and onto Neponset Ave.
Nice view from the Hancock Street bridge. There were some businesses along here, then it got more residential. Some trips go up Freeport Street to serve the Puritan Mall. but we just continued down Neponset Ave, where there were some closely-spaced houses. Occasionally there would be a few businesses but it was mostly residential. Neponset Ave became Adams Street, but right after that we turned onto Gibson Street, which had some nice apartments (and a not-so-nice public works department). We then turned onto Dorchester Ave, and then again into the Park Street busway. I'm surprised that they actually put a busway here, considering how close to Fields Corner it is. There were some businesses here, as well as a mall. We went up Geneva Ave, then onto another busway that for some reason went right next to Fields Corner without any stops. The busway made a u-turn around the station, and the actual stop was on the other side. No Quincy Station? What happened to it? Now we were a 202, but we headed back the same way as before, via Geneva Ave, the Park Street busway, and Gibson Street. But instead of going down Neponset Ave like before, we used Adams Street, which had some apartments that eventually became houses. It continued like this for a while until near Gallivan Boulevard, when it suddenly became all businesses. We continued onto Granite Ave, which was residential. I could see the bridge that the 215 uses to get over the Neponset River, but we turned off just before it onto Hill Top Street. There was a nice park on one side of the street with a playground and houses on the other. Soon we went back into the Keystone Apartments parking lot, actually picking someone up this time, then went back up Hallet Street. Interesting view in the Keystone Apartments parking lot. We made our way over the bridge again, then turned onto Newport Ave Extension. We went through the massive office park, as mentioned in the North Quincy review, and then past a marsh. Turning onto West Squantum Street, we drove over the Red Line tracks and into the North Quincy busway. Mission accomplished. Ridership: It was pretty quiet, being a Sunday. There were exactly eight people who rode in each direction, many using the route for local service. Fields Corner and North Quincy, the two subway connections, weren't that busy, with only a few people getting on and off at each. Pros: The two routes serve that awkward area in between the Ashmont and Braintree branches. It's nice that buses go in both directions on the loop, so people don't have to take really circuitous trips like they might if the loop was one way. The 201 provides most morning rush hour service, while the 202 covers the evening rush; both go about every 15 minutes during those periods, which is pretty good. Midday is about every 20 minutes between the routes, and night service is every half hour, provided exclusively by the 201, until 1 in the morning. On Saturdays, the routes run about every 25 minutes together. So overall, not a bad schedule. I also had a really nice driver, whom I was talking to throughout the entire ride, but that doesn't affect the score of these routes. Nearby and Noteworthy: There were a few businesses along the route, the most prominent of which being at the intersection of Adams Street and Gallivan Boulevard. Honestly, I thought I would be giving these a much lower score when I started this review. But it turns out that these buses are pretty good after all. They serve what they need to serve, and get the job done with fairly frequent service. But really, someone has to take a stab at making that map less confusing.